What does Beijing's air pollution do to your lungs? Breathing the polluted air in Beijing has the same effect on the lungs as being a heavy smoker, a study carried out before and after the 2008 Olympic Games has shown. Researchers from Peking University have shown that residents of Beijing have impaired lung function – but that their lungs can revert to normal during clean air periods such as during the Olympic Games, when air pollution was artificially curbed for a few weeks. The findings come from a novel series of lung function tests done on 200 Beijing residents before, during and after the 2008 Olympics. They found that ordinarily in Beijing, the mean PM2.5 (83 µg/m3) is more than three times higher than the WHO׳s safe limit of 25 µg/m3. At the same time, lung function of Beijing residents (as measured by peak expiratory flow or PEF) was well below the normal range for healthy lungs. Lung function was impaired by 16-40% for men (PEF of 418 vs a healthy range of 500-700 L/min) and by 23-42% (PEF of 292 vs a norm of 380–500 L/min) for women. During the Olympic Games the closure of factories and curbs on use of vehicles resulted in air pollution levels falling and particulate matter levels were reduced up to 60%. During this brief ‘clean air’ window lung function was observed to increase by 17% in females and 13% in males, “suggesting an improved airway status after 40 days of lowered exposure to air pollution.” The researchers said. Interestingly, lung function improved more in non-smokers than smokers and in younger, female residents compared to male and older Beijing residents. The clean air period in Beijing also saw a reduction in the number of Beijingers with rapid breathing (more than 20 breaths per minute) – a typical response to pollution and impaired lung function. Lung function deteriorated back to unhealthy levels after the Olympics when factories were re-opened and pollution levels returned to their usual levels. The researchers said their findings confirmed the adverse effect of particulate matter in the atmosphere on lung function. “Deposition of particulate matter induces increased oxidative stress that not only results in DNA, lipid and protein damage, but also leads to the inflammatory responses,” they noted. They said the pollution curbs implemented by the Chinese government during the 2008 Olympics had created conditions for a natural experiment that showed the impact of air pollution on Beijingers’ lung health. They said the findings confirmed the adverse effects on lung health but showed that these cold be reversed – at least in some sections of the population. However, they also noted that long term exposure to air pollution in Beijing was likely to have more severe ongoing effects on lung health. The study is published in Environmental Research. 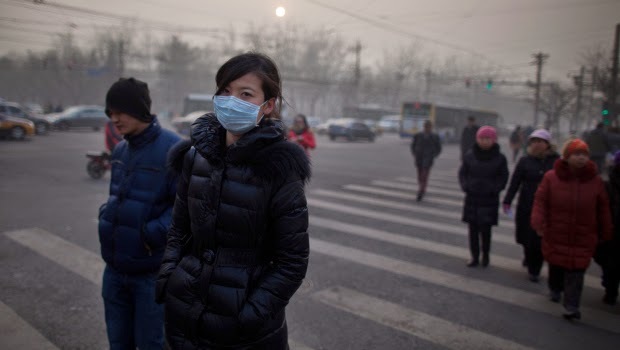 Chinese people living in the capital regularly wear unstable material masks,more enriching than defensive, and they're beginning to get stressed that the air is influencing their health.The government requested a few industrial facilities close down and limited the quantity of government-owned cars in the city,yet nobody appears to be certain that a prompt and supportable solution is near. Human science begins when man developed haggle. Progressively the human populace expanded and to enhance the life, science created.